Everett's Mike Sainristil has been a leading contender for the award since the preseason. Throughout the MIAA High School Football season, SuiteSports released its MIAA Football Player of the Year candidates, adding to the list on a weekly basis. Midway through the regular season we began with five candidates, before eventually finishing during the week of the state semifinals with 14 total candidates. Now, SuiteSports and its panel of writers, correspondents, and editors, is ready to release its five finalists for its 2018 MIAA Football Player of the Year Award. Back in 2016, Duxbury quarterback Bobby Maimaron took home the honor in helping to lead Duxbury to a Super Bowl. Then, last year, King Philip two-way star Shane Frommer earned the award after propelling King Philip to 25 consecutive victories and a second straight state championship. Now, these five players are hoping to join Maimaron and Frommer among those who have won the award. The winner will be announced on Wednesday, December 5th along with our offensive, defensive, breakout, underclassmen, and coach of the year awards. To hear more about how we will go about choosing the winner, tune in to our MIAA High School Football podcast from last night. Here are the five finalists for the 2018 MIAA Football SuiteSports Player of the Year. Sainristil's talents have never been a secret, and this entire fall seemed to be just a celebration of them for all those in attendance. 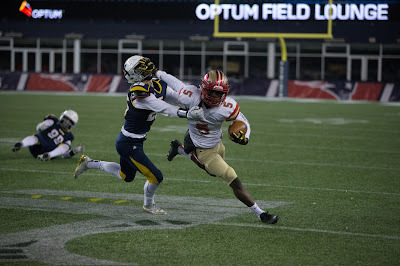 The senior from Everett is special not only because he may be the top wide receiver in the Bay State, but because he is arguably the best defensive back in the region. After beginning the season as a Virginia Tech commit, Sainristil reversed course and announced his intention to play at the University of Michigan. His combination of agility, athleticism, and quickness unmatched, Sainrisitl was a threat each and every time he touched the football both out of the backfield and in the passing game. What made him so dangerous, however, is that he had the capability of turning an interception into six points in the blink of an eye. The future Wolvernine was the centerpiece of two Everett Super Bowls and a 10-1 season for the Crimson Tide this year. For the season, Sainristil had 32 receptions for 792 yards and 12 touchdowns, 32 carries for 290 yards and five touchdowns, and six interceptions. All told, when you consider that Everett only actually played 10 games (Malden forfeited the twos week 7 matchup), Sainristil put up eyebrow raising numbers compiling 1,082 total yards and 17 touchdowns. Smith entered the season widely considered as one of the top offensive threats in Massachusetts. From the opening kickoff, he only lived up to those expectations. Committed to Duke, the six-foot-five, 225 pound wide receiver/tight end hybrid proved to be a brutal cover for opposing defenses. His hands, physical build, and ability to high-point the football allowed him to pile up the receptions and yardage on a weekly basis. While the Rockets were unsuccessful in their quest to emerge from Division 1 South, they managed to finish the season with a 7-4 record while falling just short, 38-35, to eventual sectional champion Catholic Memorial in the semifinals. Smith was at the center of the team's success, helping to attract attention away from other targets and still proving to be valuable as a blocker up front. In that loss to the Knights, Smith had seven catches for 179 yards and two touchdowns. He finished his career in style on Thanksgiving Day returning a kick-off 92 yards for a touchdown in Needham's 14-13 win over rival Wellesley. For the season, Smith finished with 56 receptions for 1,043 receiving yards and 16 total touchdowns. All season long, North Andover's offense has been explosive with McElroy leading the charge from under center. The senior dual threat has torn apart defenses throughout the season as the Scarlet Knights have scored fewer than 28 points on just one occasion and found themselves in just a single one-possession game. When contained in the pocket, McElroy possesses the capability of hitting his star wideouts both on quick crossing routes as well accurate deep balls. McElroy, however, is also equally dangerous on the run able to scramble for long gains and throw accurately when flushed out of the pocket. McElroy's top performance of the season came in the Scarlet Knights second game of the regular season where he compiled 342 yards and a pair of touchdowns in a win over Lowell. In the postseason, McElroy has been impressive in leading North Andover to the Division 2 North crown and a Super Bowl appearance. Against Woburn in the sectional semifinals, he was a perfect 6-of-6 for 142 yards and three touchdowns. A week later versus Lincoln-Sudbury, he threw for 129 yards and two more scores. A three-sport athlete, McElroy has thrown for 1,552 yards and amassed 25 total touchdowns. Scituate's Aidan Sullivan has emerged as a legitimate contender for the award this postseason (Photo Courtesy: Brian Woods). Sullivan was one of the final additions to our list, but he has only strengthened his candidacy as the postseason has gone on. The Sailors quarterback is not overly imposing with his physical height or weight - he stands at five-foot-10, 170 pounds - but his consistency and clutch performances have Scituate on the verge of its first Super Bowl. One season after the senior was sidelined towards the end of the season with an injured meniscus, Sullivan has showcased the talents that enamored him amongst the coaching Sailors coaching staff as a sophomore. Over the course of the regular season, Sullivan led Scituate to a 6-1 record, but its in the postseason where his mental aptitude for the game, as well as his dual threat capabilities, have really shined through. 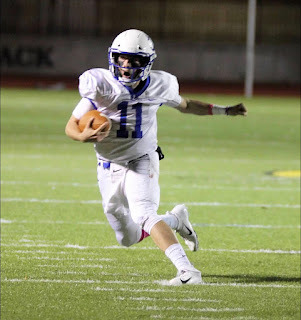 In an opening round win over Dennis-Yarmouth, Sullivan led Scituate on a 15-play, 98-yard drive in the game's waining moments before connecting with Jack Ruble for a 10-yard touchdown that pulled Scituate within a point. Sullivan then sealed the victory using his prowess with his legs as he jolted left on a keeper, got around the Dolphins edge, and jumped into the end-zone for the game winning two-point conversion. Sullivan followed up by throwing four touchdowns on the road against Holliston, and in the state semifinals versus Swampscott he fired three more passes that generated scores. For the season, Sullivan has 2,127 passing yards to his name to go with 30 total touchdowns, a mere six interceptions, and a 66-percnet completion percentage. 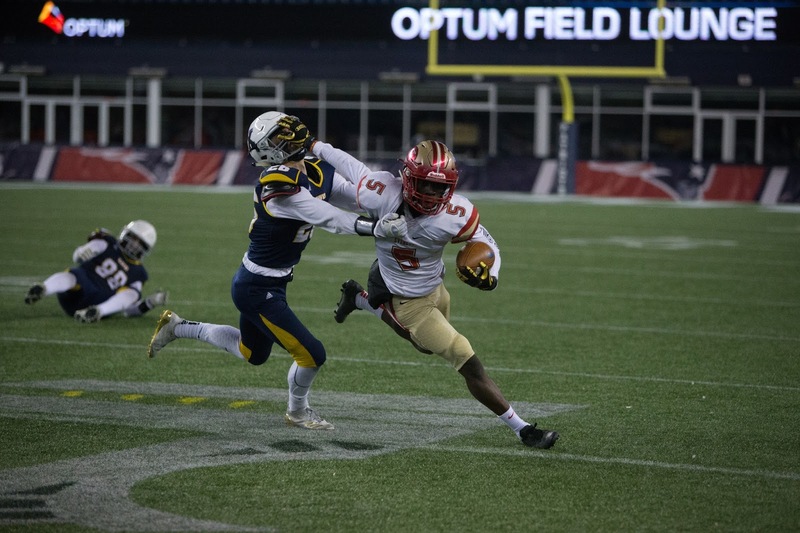 Brunelle piled up ridiculous numbers from the wide receiver spot on a weekly as he helped lead a prolific St. John's Shrewsbury offense back to the Division 3 State Semifinals. Going up against some of the top defenses that Central and Western Mass. has to offer proved to be no deterrent for Brunelle. He had top performances against teams such as Wachusett, Shrewsbury, and even in the Pioneers loss to Springfield Central that ended its Super Bowl aspirations. The only junior to make the list, Brunelles's hands, physical build, and talents as a route runner put him in a class all by himself when it came to wide receivers in 2018. Through St. John's three postseason games, Brunelle had 21 receptions for 353 yards and six touchdowns. Over the course of 12 games, covering both the regular season and postseason, Brunelle had a state-leading 70 receptions for 1,157 yards and 18 touchdowns. Jay Connolly in Tewksbury has 31 wins as a starter. 11-1 this year and leading his team to Gillette. This kid does not get the recognition he deserves. All he does is win!